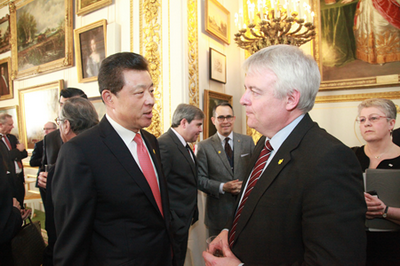 On 3 March, Ambassador Liu Xiaoming attended St David's Day Reception hosted by the Welsh Government at Lancaster House in London and held friendly talks with First Minister Carwyn Jones of Wales. St David's Day is a traditional Welsh festival. First Minister Jones thanked Ambassador Liu for attending the Reception. He spoke highly of the sound momentum of growth in China-Wales relations, noting that Vice Premier Liu Yandong's visit last year vigorously improved the enthusiasm of people from all walks of life in Wales to expand cooperation with China. Jones said that he himself and the Welsh Government are willing to remain committed to developing relations with China, deepening pragmatic cooperation and promoting people-to-people exchanges. He looked forward to visiting China again in the near future. 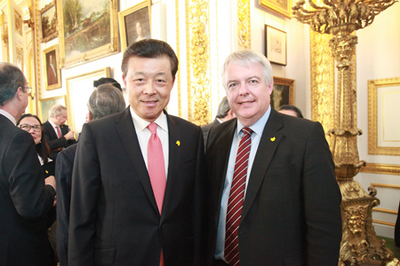 Ambassador Liu extended congratulations to First Minister Jones on St David's Day. He appreciated the importance Jones attached to relations with China, thanked him and Welsh communities for their warm reception to Vice Premier Liu Yandong, and encouraged Jones to visit China again. Ambassador Liu said that China values exchanges and cooperation with Wales in various fields, and hoped to see the cooperation between China and Wales grow and set an example for similar cooperation between China and the UK so as to contribute to the "Golden Era" of China-UK relations.